I really got a huge kick out of the fact that it was my husband who picked up the book. We grabbed the elevator from the third floor and he spotted it dead on. I was like, "neat" and preceded to get in the elevator. My husband preceded to tuck the book under his arm. In short, all about shearing and carding and washing and spinning and (yes) knitting! Its just adorable and simple. 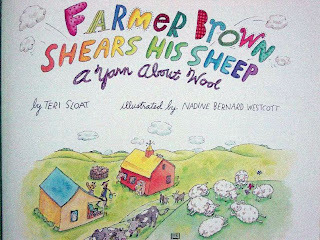 Father Brown shears his Sheep is probably and great book for the times your 2-5 yr olds look at you like your crazy or wants to know where fiber comes from.